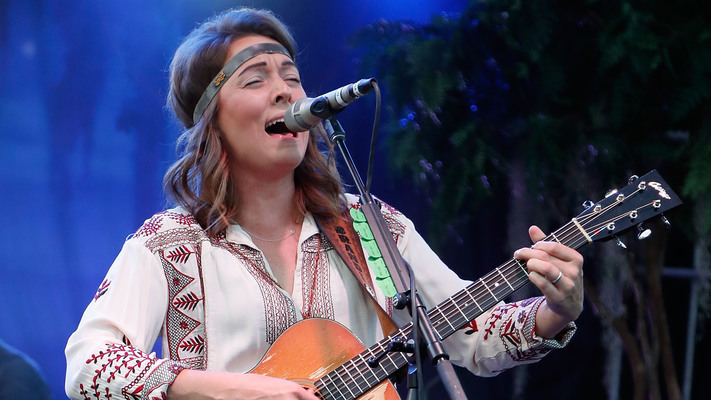 Brandi Carlile was born in the small town of Ravensdale, Washington, on June 1, 1981. With few children living nearby to paly with, Carlile learned to entertain herself by camping and hiking in the nearby woods and teaching herself to sing. Growing up, her musical preferences consisted of classic country music such as Patsy Cline, but listened to more mainstream artists as well, such as pop/rock icon Elton John. By 17, she taught herself how to play guitar and would perform anywhere she could get a gig, eventually meeting twin brothers Tim and Phil Hanseroth, who were in a local rock band. When the Hanseroth’s band broke up, Carlile asked the guys to form a group with her and quickly began touring. The new group was soon headlining small venues and opening shows for successful artists including Dave Matthews and India.Arie. With the help of Carlile’s emotionally charged songs and guitar work, she and her new band had no trouble getting noticed. By 2004, Carlile was signed to Columbia Records and released her self-titled debut album in 2005. Shortly after the release of her debut album, Carlile began touring excessively. She spent much of the next two years performing around the country and by the end of 2006, she had embarked on several headlining tours. She had also supported a variety of artists including Ray LaMontagne, Indigo Girls, The Fray, Chris Isaak and Shawn Colvin. Carlile’s sophomore release, The Story, was released in spring 2007 and its title track was featured in several commercials, (most famously the General Motors ad that aired during the 2008 Beijing Olympics), which helped to boost the records sales. In 2007, several of Carlile’s songs were also featured on the hit ABC drama Grey's Anatomy and her fan base continued to grow tenfold. Her album, Give Up the Ghost, released in 2009, reached the Top 40 and featured a duet with her childhood idol Elton John. With an extensive catalog of music under her belt, Carlile has racked up some serious credits as a songwriter and musician. In 2017, she commemorated the tenth anniversary of The Story by assembling a star-studded charity album for War Child called Cover Stories: Brandi Carlile Celebrates 10 Years of the Story. The record features covers by superstars such as Dolly Parton, Pearl Jam, Kris Kristofferson, Jim James, and the Avett Brothers, as well as many others. Carlile’s sixth studio album, released in February 2018, was co-produced by Dave Cobb and fellow country star Shooter Jennings and is titled By the Way I Forgive You.